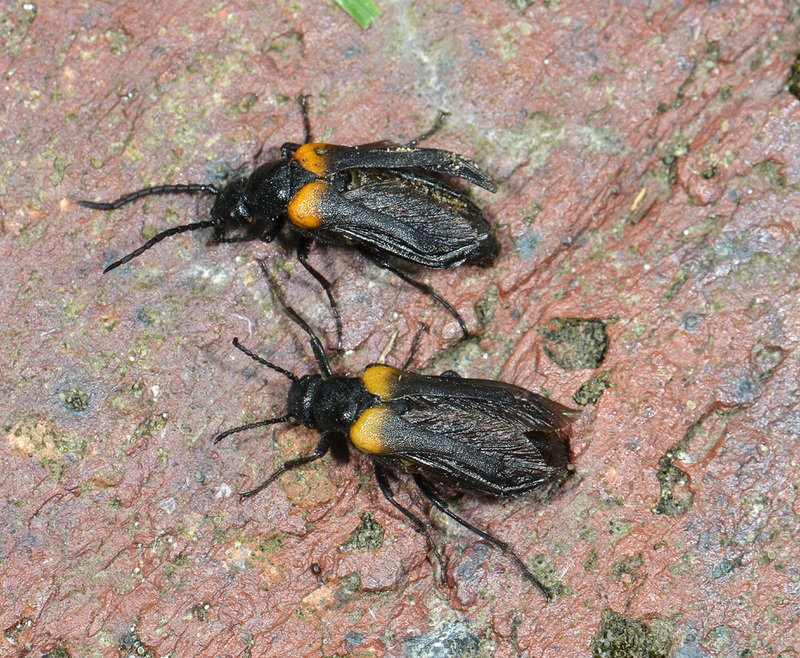 The Flame-Shouldered Blister Beetle – re-discovered at last! One of Britain’s rarest beetles is the secretive, endangered Flame-shouldered Blister Beetle Sitaris muralis – belonging to the family Meloidae (oil and blister beetles). This attractive 8-14 mm long beetle was last found in Oxfordshire up until 1969, but then it was rediscovered in Brockenhurst, Hampshire in 2010 (the last New Forest record before that was in 1947) on a brick wall over 100 years old. 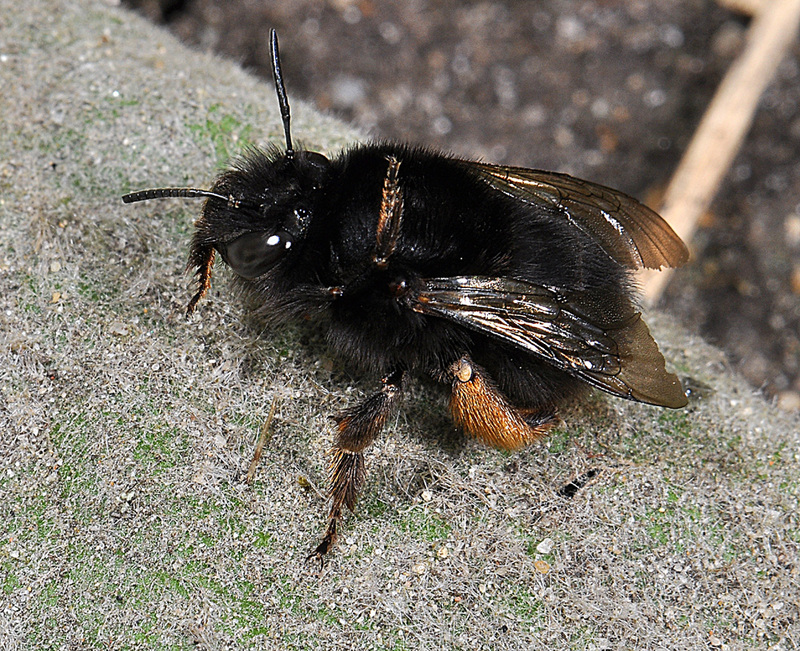 However, they are seldom seen outside the nest burrows of the Hairy-footed Flower Bee Anthophora plumipes in old mortar [the entry / exit point looks rather like bullet holes]. 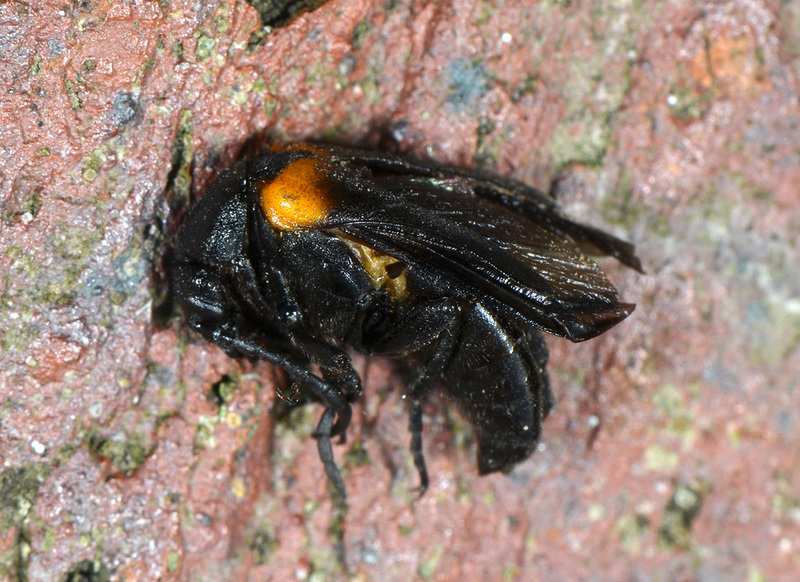 It is not clear why this parasitic beetle is so rare as the host is widespread throughout Britain and common in the south in spring; the larvae feed on the bee’s brood. Paul and Helen Brock have found the beetle each year since 2010 mainly in August, mostly dead with at least one apparently evicted from the nest (the latest finds though, on 20-21 August 2013 were alive). Others may be trodden on by passers by, as these clumsy insects fall to the pavement in a busy village site. The slightly brighter males have much longer antennae than females; both sexes have strange-shaped wings designed to enter a bees nest. The bright orange is presumed to be a warning. In addition to sporting warning colours, during perceived danger such as attack by a possible predator, males curl up in defence, remaining in the position for up to a minute. This elusive insect could turn up almost anywhere, but is most likely in southern England on a brick wall- so keep an eye out next time you are out and about! Our thanks to Paul and Helen Brock for supplying the content and photographs for this post. The Hope Entomological Collections blog has landed! All of the content of the blog has now been transferred over to the WordPress platform- we just have some final tweaks to make. The toughest decision is going to be over the image that we use for the background. So many insects, not enough time. We’ll be trialling a number of different pictures over the next week or so, so remember to check back regularly and let us know which one you like best by leaving a comment on this post. Today’ss background picture (also above) is of a historic collection drawer from the J.O. Westwood Paussidae collection. Westwood was the first curator of the Hope Entomological Collections.